Finding your Rookie Groove….at any age! On August 1, I officially began my new “job” as part-time grant-writer for Alive and Well Women. On paper, I am completely unqualified for the role. I helped write one grant proposal in July. Period. On my first day of “work” I went to a community college class to learn what a grant-writer does (which I thought might be helpful). It didn’t seem too hard….after all, I researched companies and wrote tons of responses to RFPs during my corporate career. How different can it be? And since the nonprofit world is presumably kinder and gentler, I figured raising, say, $400,000 by the end of the month seemed totally reasonable. Rookie mistake! I quickly learned there is just as much research required in finding grant money as there is in finding corporate project money. The go-to database for searching foundation grants is a paid subscription service, but available for free at certain local libraries. No longer having the deep pockets of (or paychecks from) a Fortune 500 company, I trudged off to the closest library site, which is in a particularly rough neighborhood of Pasadena. After fumbling around for a couple hours on the computer terminal, I signed up for a free one-on-one with a librarian the following Friday. 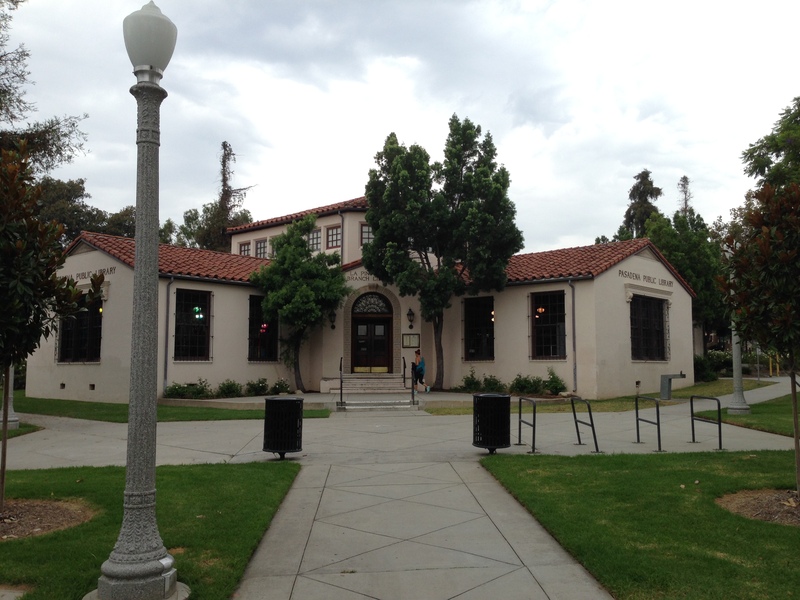 My new office building in Pasadena, also known as the public library. That Friday, I put on make-up and my best shorts and showed up for my appointment with Darrell at the library. He was a very kind, soft-spoken African-American gentleman who met me in the non-profit research center room, and who I was fairly certain would not care a whit about Alive and Well Women. I was itching to get started on the training, but instead of turning on the computer, he leaned back, looked at me, and asked, “What are you trying to do?” I explained I am co-founder of a nonprofit and need to learn how to use the Foundation database to find grant money. “OK, what is your nonprofit all about?” “What are your goals?” “Who is your target audience?” “How do you expect to accomplish your objectives?” “Do you have a functioning Board?” “Have you received 501(c)(3) status?” Before we ever looked at the computer, we had a 45-minute in-depth discussion about organizational planning, goals, resources, and mission. “The reason I’m asking you these questions is that I want to see how far along you are in your nonprofit, and how well you are able to articulate your vision.” To my utter astonishment, Darrell then shared his positive assessment and detailed thoughts about where he saw the need for Alive and Well Women, which was a stunning confirmation that he actually tracked with my rambling presentation. It wasn’t at all what I was expecting, but it was exactly what I needed. By the time we finally turned on the computer, we were ready to effectively search for foundations that shared goals with Alive and Well Women. After we compiled a list of hundreds of foundations that were potential matches, Darrell gave me the homework assignment of going through each one of them to narrow the list. “Then I start calling them?” I asked. “Nope, then you do more research,” Darrell said, pointing to the volumes of resources in the shelves behind him. Since then, I’ve spent countless hours poring over records of foundations, looking for grant limitations that would exclude them from my list, finding their stated mission and goals to see if they align with ours, and then reviewing their Form 990s for additional financial and grant information. The work is tedious and time-consuming, and I haven’t been as efficient as I’d like, and I already know I’d love to hire a intern to help someday, but I also know it is necessary for me to learn. It is almost the end of August, and I haven’t raised a dollar. But, I have become familiar with hundreds of foundations, whittled my list down to 10-15 strong matches, and assembled a good profile of each. In the process, I’ve gained a better sense of how to do research and where to find information. And in spite of my occasional frustration with the pace of progress (I must remind myself that I’ve only committed two afternoons a week – God continues to work with me on patience) I do feel a sense of accomplishment. According to Liz Wiseman, it’s not what you know, but how fast you can learn. The Inexperienced benefit by being unencumbered by assumptions. We (I’m putting myself firmly in the Inexperienced column) solicit information by asking questions and seeking information. Rookies have a steep learning curve, and often don’t know how hard the work is at the outset. We move in baby steps at first. But rookies achieve quickly because we learn fast (we are desperate!) and are resourceful. Liz says the learner’s advantage is that we tend to do our best thinking when our challenge level goes up. And, importantly, our satisfaction also goes up. This past month took me back to various times in my life and career when I was new to jobs or projects or roles. It wasn’t always enjoyable, in fact often stressful, but there was also excitement and contentment in meeting the challenges. Although I don’t have the same level of risk or anxiety associated with being a “Rookie” in my current situation (I’m not worried about losing a job or salary) it is still a sharp learning curve. Liz Wiseman reminds us of the benefits of re-igniting our “Rookie Smarts,” even as leaders or at advanced stages of career or life. She warns us that when we plateau – when things are smooth, we have all the answers, we get positive feedback, when we’re busy but bored – we start to die. On a learning curve we find the divine, the satisfaction, our greatest joy. We can and should strive to be Rookies…no matter our phase of life! Look for opportunities to be a Rookie again. Put yourself at the bottom of a learning curve. Volunteer for things you’ve never done before or look at things you’ve done before with Rookie eyes. Sometimes backward is the best way forward. Be open to unexpected mentors (like Darrell at the public library) and learn all you can from them. Be willing to mentor other Rookies when they need help. Be aware that Rookie Smart Mode can be stressful, but look at the anxiety as a sign of growth. Don’t be afraid to think like a Rookie in any situation! Alive and Well in Retirement! This past weekend was the two-year anniversary of my first day of retirement. Looking back, these past two years have been a somewhat inconceivable journey, an education in more ways than I expected. My last blog post was November 2014. I meant to keep it up, but for a variety of reasons I didn’t have the time or the inclination to post. Among other things, I was consumed with planning festivities around my son’s graduation from USNA, suffered a major illness in March (pneumonia) that really knocked me for a loop, and then, once recovered, more travels with my husband (a 52-day road trip!). Along the way, however, I felt a need to be more intentional about crafting a future life for myself. My first year or so of retirement I was purposely open-minded but noncommittal to activities and experiences. I tried new things, discovered activities I unexpectedly love (like yoga) and others that didn’t click as well. I mostly resisted obligations so I would be free to travel with my husband (another thing I found I love). I searched for the right rhythm of time spent alone, with husband, with friends. But with my son now graduated from college and fully launched, I sensed a new phase of my life that could be one of the best yet – if I was deliberate and purposeful about it. When else would I have my current absence of responsibilities (no job, parents or children depending on me) and the time, health, and money to be doing things truly fulfilling? As my husband always says, I have way too much horsepower to not be doing something. But what was that “something”? Although I didn’t realize it at the time, in hindsight, this kicked off a soul-searching process, in which I examined everything in my life – marriage, family relationships, friendships, faith, leisure, work. I threw things up and arranged and rearranged the pieces in my mind. I thought and prayed about each area of my life and how they would fit into my ideal purposeful life. All this mental activity was overlaid by a relatively new factor in my decision-making – my own mortality – which argued against wasting time and for decisiveness and risk-taking. 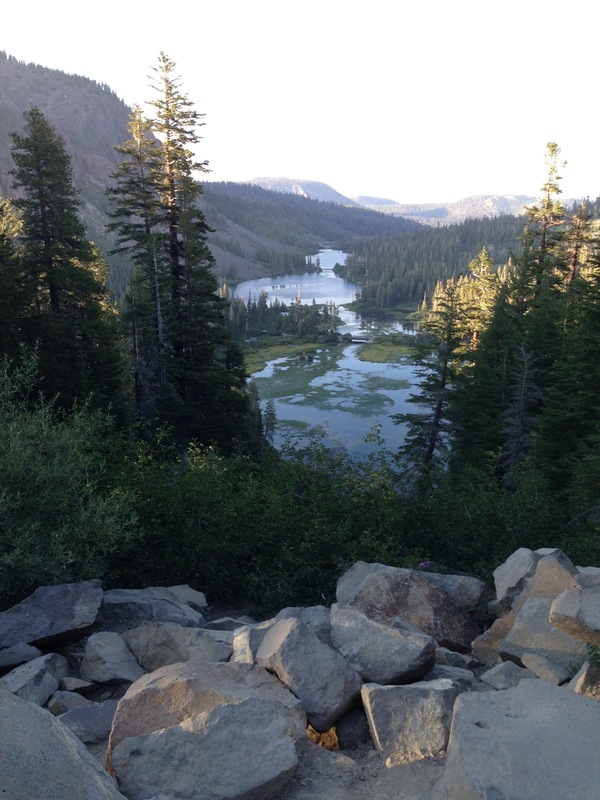 A key awareness that came out of this contemplative process was around the question of work. Although not feeling a call to go back to full-time employment, I do miss aspects of my former work life – the structure, camaraderie, challenge, and, honestly, the compensation. I considered various part-time and contract job options. I thought about writing or blogging as a career. I prayed for opportunities that would address my longing for meaningful work but also allow space for other parts of my retired life that I now cherish. In one of my 1:30 AM brainstorming sessions (I often do my best thinking in the crossover between awake and asleep) a plan materialized. But first I must back up. In January of 2014, about five months after I retired, I reconnected with my friend Cissy. She and I were in a women’s prayer group many years ago and had kept in casual contact with each other after the group disbanded. Over lunch, I told her I’d long wanted to work with a nonprofit organization after I retired, but was not sure which one or in what capacity. Cissy shared that she wanted to start a nonprofit and asked if I would be willing to help. That invitation started us both down an often-miraculous path resulting in me today being the co-founder (with Cissy) and Board Chair of Alive and Well Women. Our mission is to help women navigate toxic cultural messages about health, beauty and sexuality so we can thrive amidst the multiple stages of the female life cycle. In the past year and a half, we have formed the Board, obtained 501(c)(3) status, and raised enough money to develop our branding and website (which we are in the process of launching). Alive and Well Women was clearly Cissy’s brainchild. She is a licensed Marriage and Family Therapist (MFT) and nationally recognized eating disorders specialist. She began offering retreats, workshops and groups in 2007 out of her discovery that community support is the key to healing women’s shame-based relationships with their bodies. Her idea in forming the nonprofit was to allow us to bring the curriculum to women who might not otherwise be able to afford the workshops. Thus far, I have thought of myself as the person who helped Cissy launch her nonprofit. I was reluctant to commit too much to the effort. Then, during my period of soul-searching, I worked with Cissy on a grant proposal. What I discovered is that grant writing is not much different than responding to RFPs, something I did in my former corporate career, but far more satisfying. Fast forward to my 1:30 AM Sunday session. What came to me in an inspired flash was that I could be the Grantwriter for Alive and Well Women! That would allow me to work part time (and still have the flexibility to travel), to write, collaborate with Cissy, develop new skills and networks, and potentially earn compensation (if I am successful in winning grant funds). I proposed the new arrangement the next day to Cissy, who was both grateful and encouraging. The following Saturday I took a class that was offered coincidentally (or not!) through the local community college on grantwriting, which undoubtedly spared me significant trial and error time. So, I’m off on my new “career”! What I have since discovered, through research and meetings with other nonprofits, is that grantwriting will not be as easy as I first envisioned. Prior to even writing a grant proposal, it takes a fair amount of research to find appropriate funding sources, and then more effort to determine whether potential grants are worth pursuing (as in the corporate world, a big part is who you know so networking is important). Then there is strategy for finding the “mission match” (discovering and demonstrating the complementary goals for funder and recipient). But I am so enjoying the challenge! And something else remarkable happened along the way. As I have become more emotionally committed to Alive and Well Women, I find myself crafting my own “Alive and Well Women” story. Rather than just being Cissy’s friend who helped start the nonprofit, I am discovering the parts of Alive and Well Women that speak to me in my own life journey and embracing them. I am finding that, for me, I have more passion for issues of women’s empowerment than embodiment. As a result, I have decided to re-focus my blog as a forum to discuss what “Alive and Well Women” means to me in this phase of life. Stay tuned!